I have a hypothesis about raising healthy eaters. Expose them to enough healthy meals, chock-full of veggies and whole grains, and they’ll grow up to eat healthy–even if they turn down the dishes now. Call me callous, but I don’t really mind if on some nights my kids take one bite of dinner and head for the cereal cabinet. Dinner today’s an investment for their future, right? Wish me luck because if my experiment fails, I won’t know for another dozen or so years. And there are no second chances. Whole Wheat Deep Dish Pizza: This was inspired by my fabulous friend Rachel Zimmerman, but because I never made my pizza deep dish, it turned out more well done than I would have liked. Still, only one piece was left at the end of the meal, and no one complained about the whole wheat flour. Rating: 1 5-Star and all the rest 3-Stars. Homemade Fries: Besides the baby, who through his on the floor, there wasn’t a fry left. Even the sweet potato ones were gone. 5-Stars across the board. Cauliflower Cheese Soup: We were scraping the pot. This was the creamiest soup I ever made. One 9-year-old rater gave it stars off the charts, the rest gave it 5’s. Then there was the girl who tried a tiny bite just to get her marshmallow. She gave it a 1. 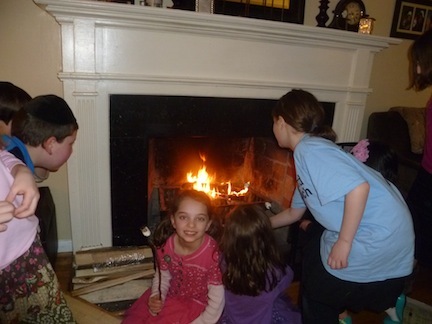 Roasted Marshmallows: I have a rule about roasting marshmallows over an open fire. None of my other rules apply. And certainly no rating system is necessary. The best part of the meal? 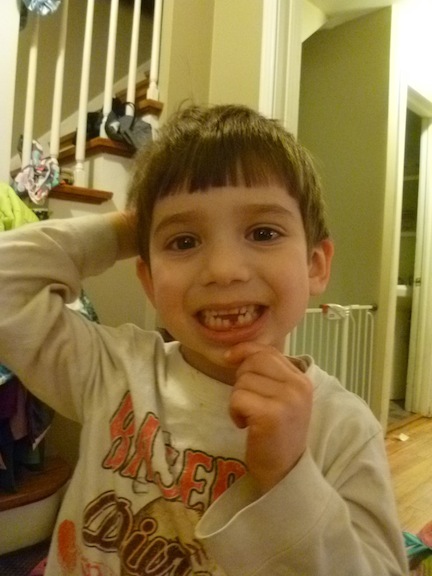 Not only was the food all gone, but a certain 4-yr.-old discovered a tooth missing as well. Combine the flour, yeast, and salt in a food processor. Turn the machine on and add 1 cup water and the oil through the feed tube. Process for about 30 seconds, adding more water, a little at a time, until the mixture forms a ball and is slightly sticky to the touch. Knead by hand for a few seconds to form a smooth, round dough ball and place in a lightly oiled bowl. Cover with a warm, wet towel and leave it in your oven with the light on (oven should be turned off) and let rise until the dough doubles in size, 1 to 2 hours. Spread the dough into a greased 9×13 pan and pierce with a fork. Spread tomato sauce around generously. Add any toppings and then a ton of mozzarella cheese. Bake on 375 degrees for 25 minutes. Wash potatoes and peel the sweet potatoes. Slice them in the food processor. Spread them across a baking sheet and drizzle with olive oil and salt. Bake on 375 degrees for 25 minutes until edges are crispy. Saute the garlic and onion in butter until soft and slightly brown. Add the cauliflower and saute 3 minutes more. Add water to cover and salt and pepper and bring to a boil. Let simmer until very soft–at least 20 minutes. Pour soup into blender or use immersion blender until creamy. Add the milk and heat without boiling. Serve with shredded cheese on top. What? No kudos to the person who made deep dish pizza for our dinner last week and reminded you that making deep dish was yummy and possible? Okay, to all my readers: MY FABULOUS RUNNING PARTNER AND FRIEND, RACHEL ZIMMERMAN, MADE DEEP DISH PIZZA FIRST!